If we are in a new golden age of television, Washington, D.C., is our capital. Sure, a case can always be made for New York or L.A. being the center of the TV’s fictional universe, but, in recent years, D.C. has been the locus of some of this era’s best entertainment. We can trace this upswing back to the “The West Wing,” the platonic ideal of government, where noble public servants walked and talked through the corridors of power while never losing sight of the greater good. It was comforting, uplifting to imagine these people actually existed. In our leaders, we looked for shades of Jed Bartlet, and pretended the White House really was full of Tobies and Sams and CJs. Conversely, “House of Cards,” with all its Machiavellian duplicity, depicts our darkest nightmares brought to life. We fear that power-hungry monsters like Frank Underwood could actually exist; that democracy is an illusion; that all hackers have pet guinea pigs. While all these shows depict our government as we hope or fear it to be, only “Veep” comes close to showing Washington as it is: ambition stymied by mediocrity, principle subverted by compromise — a city full of normal people in way over their heads, effective on occasion, but, more often, feckless. It’s a deep well from which much humor can be drawn. “Veep,” which just kicked off its third season on HBO, is easily one of the best comedies currently on TV. Created by Armando Iannucci (“The Thick of It,” “In the Loop,” “I’m Alan Partridge”), the series is witty, fast-paced, tightly-written and profoundly profane in a way that would make Lenny Bruce smile. The show is not only a delight to watch, but also a master class in the versatility and effectiveness of the F-bomb. While viewers may question the verisimilitude of the show’s universe, Iannucci professes that he’s done his homework. He has often noted the attention to detail the show pays, right down to the cramped offices, rampant infighting and attendant profanity. The show has become a favorite among the very group it skewers, with many D.C. insiders identifying with both characters and storylines. Julia Louis-Dreyfus (“Seinfeld,” “The New Adventures of Old Christine”) plays Vice President Selina Meyer, an-assumed democrat — her party affiliation is never divulged — who landed in the VP chair following her own failed bid for the Oval. But those looking for hints of, say, Sarah Palin or Hillary Clinton, in Selina’s character will be disappointed. Iannucci based his decision to cast a female in the role as a way to both look forward and distance the show from any parallels viewers might draw with real-life VPs. As Selina, Louis-Dreyfus is delivering some of the best work of her career, even surpassing the highest points of “Seinfeld.” The role has garnered her two well-deserved Emmy’s for best lead actress in a comedy. Her comic timing is impeccable, and her delivery is just as sharp. It’s a necessary skill in a show where the jokes come fast and filthy. Louis-Dreyfus is also a pro at physical comedy. A season 2 episode where Selina has a reaction to pain medication after walking through a glass door exploits Louis-Dreyfus’ physicality as good as anything by Lucille Ball or Carol Burnett. But Selina is neither a fool nor a lightweight. A women at times alone in a city of men, Selina’s slight frame can cut a mean figure. She’s a political animal, and when riled the often camera shifts its view to illustrate just how imposing she can be. Gender politics, however, don’t play a huge role in the show; Iannucci is too enamored with the farce of political theater to linger on those deeper messages. Selina is a savvy politician, albeit not one above the vanity and narcissism that plagues most public figures. A veteran of the stump, she regards public appearances with scorn only to dial up the shmooze to 11 upon entering the room. It’s a turn less gracefully executed than she thinks. Watching Selina make (and fake) awkward small talk with fellow pols or “normals” — as she calls regular voters — is the source of some of the show’s biggest laughs. 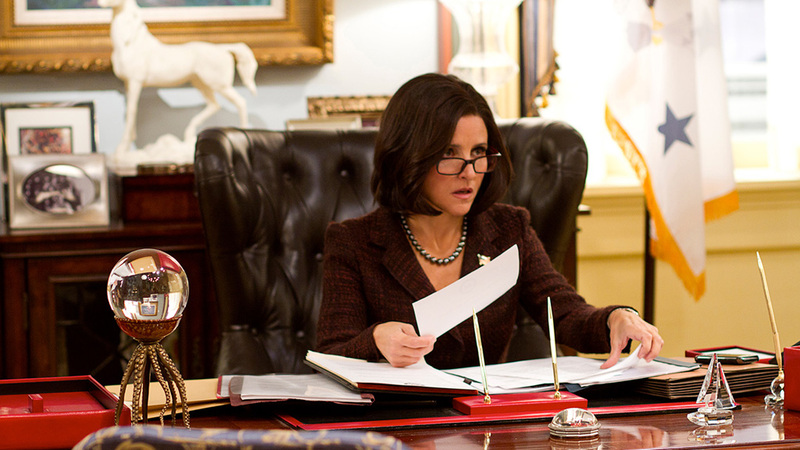 But through it all there is something likeable about Selina Meyer. She actually is kind of good at her job. Voters, as fickle as the show portrays them, actually like her. Underneath her focus-grouped veneer, is the heart of a person who got into this game because she believed she could make a difference. However, for three seasons now, the Washington of the show’s universe has told her, “No, you can’t.” Her green jobs initiative of season one was torpedoed by oil lobbyists; her effort to avoid a government shutdown in season two was derailed by the President; this season’s push for universal childcare was stifled by her own party. That latter defeat set her catatonic for half of a recent episode until her brain could reconcile the setback. It was political spin at its most depressing: “I’ve decided that I am going to let them dictate to me. Because that is my decision,” she says, her voice wavering. The cast is rounded out by what is easily one of the best ensembles currently working in comedy. As Amy, Anna Chlumsky (“My Girl,” “In the Loop”), is Selina’s tightly-wound, yet mostly capable chief of staff. Tony Hale (“Arrested Development”) is Gary, the VP’s fiercely loyal, emasculated VP’s body man. And character actor Matt Walsh (“Upright Citizens Brigade”) is in his wheelhouse as the sadsack communications director who’s so bad at his job that actually doing something right surprises even him. The staff of the Veep’s office may be hapless but they are far from alone. Throughout the show, you get the sense that no one is very good at their job. It’s a truth that permeates every office inside the Beltway and both sides of the aisle. In a deft move, party affiliations are never discussed on the show; Selina’s liberalness is only inferred. The series is not concerned with party ideologies or picking a side. Rather, it depicts both parties as being equally populated by kraven, self-serving fools. We also never meet the President — another smart choice — which allows the Selina to have the spotlight to herself. His absence is another fun bit of Iannucci satire, as even the apathetic, burnt-out White House chief of staff admits that President might be the least essential position in government. It’s those moments when “Veep’s” cynicism shines through. There’s no denying this is a cynical show. But when pressed, Iannucci suggests that it was inescapable. If this is the nadir of American democracy, “Veep” is here to wring a few laughs out of it. Iannucci explains that the show’s “jaded representation of politics” might be a better fit for the detachment from the political process the public now feels. He’s not wrong. From compromised principles to party bickering to endless gridlock, “Veep” seems to be channeling something real. To wit: a season two episode about a government shutdown aired less than six months before last year’s actual one. You can’t make this stuff up — even when you do. “Veep,” starring Julia Louis Dreyfus, Anna Chlumsky, Tony Hale, Matt Walsh and Reid Scott airs Sundays at 10:30 p.m. on HBO.